Round 1: Document Management (DM) systems go the distance with documents—comprising the core needs of management, creation, retention, and delivery of structured content. 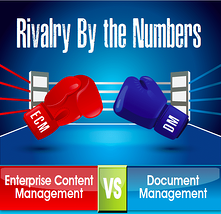 Round 2: Enterprise Content Management (ECM) outlasts DM by bringing advanced security, governance, and workflow automation tools to the ring. Round 3: DM is a signature punch focused on doing one job and doing it well, but lacks the holistic functionality of ECM from email to workflow and process management. Round 4: ECM is a one-two combo; includes the features of a world class DM, but extends them with unrivalled ability to manage unstructured and structured content. Download This Infographic to find out which content management contender reigns supreme.